Our weekly separate Pointework class is only applicable to students who have been training at a Grade 5 ballet level, and only once they are strong enough in the core, legs and ankles to do so. It is a mixed class, so different levels of exercises are given to students training at different grades, to ensure gradual development of strength and technique. This is all in addition to the pointework at the end of their separate grade classes during the week. Although being told you are finally ready to go en pointe (often the most exciting moment in a young dancer’s life!) children develop at different rates. It is really important not to rush this very important step in the training process as patience is the key here for the best results long term. There are a few criteria that need to be in place before putting a student en pointe for the first time – I have explained most of these in class to the girls but I thought it would be helpful for you to have this information as well. Please remember that these points have been instituted to enhance your child’s experience in ballet. There is nothing more disheartening than a young lady who is struggling valiantly to get on pointe, but not succeeding in spite of a lot of effort. Parents, I respectfully request that you explain to your child that it is important to be patient in the pursuit of excellence. Also, that it is important to trust your teachers and mentors in life. The strongest fortresses are always built on a sound foundation. Should have at least 2 years of training. Taking at least 2 classes of dance a week and attends classes consistently. Is responsible enough to bring all ballet equipment needed (uniform, ballet shoes, and uniform cardigan or hoodie). Is well-groomed, with hair out of the face and in a bun (no ponytails). Is able to take the entire class. Pays attention in class and works well. Should be of normal weight. Has enough of an arched instep to stand on pointe. Holds turnout while dancing – this is much more difficult to do on a 1 ½ inch base, so must be secure on flat. Has a strong, straight back while dancing, especially the lower back – all muscles are connected to the back, which must work in co-ordination with the core to result in a strong centre for a dancer. Stand as high as possible on demi-point with fully stretched legs. This step is harder to do en pointe and a bent leg is usually a sign of weakness or improper step preparation. A student who keeps her heels very low to the ground is not using and preparing her calf muscles and will not have the strength for pointe work. Point their feet while dancing – This uses the same muscles as pointe-work. These muscles need to be strong enough to support the student’s body weight on the ends of her toes. If students are not in the habit of using these foot muscles, she will not be able to support herself en pointe and will probably knuckle over on her toes and increasing the chances of injury. Once you have your shoes…. DO NOT PRACTICE AT HOME! No matter how tempting, please only work in class en pointe. 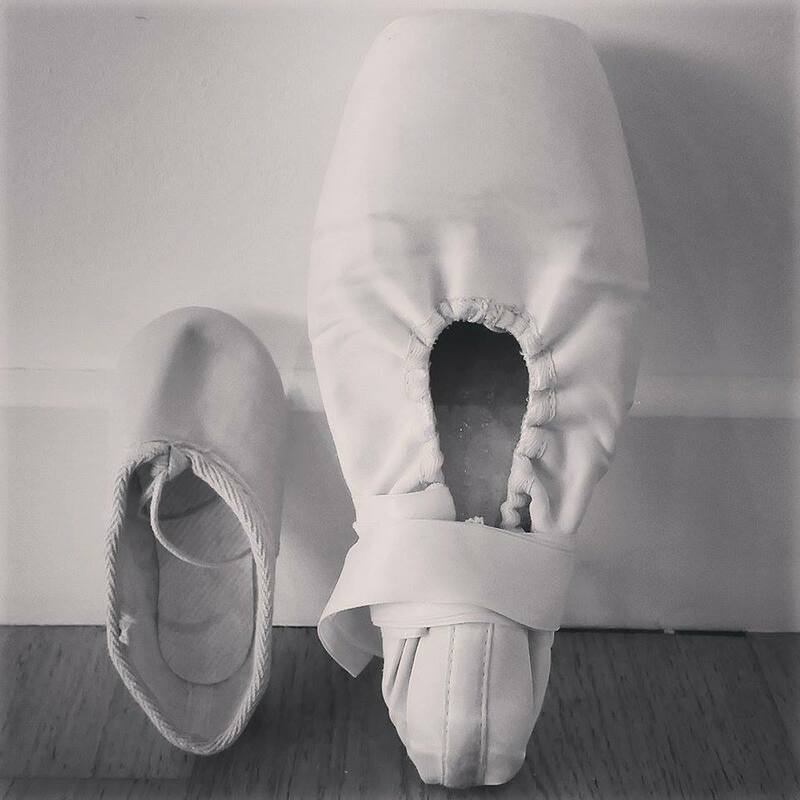 Pointe shoes need time to air after each use, so a string bag (usually given with each pair of shoes) is perfect, and if using gel pads or “ouch pouches”, do not store in the toe of the shoe. And finally, congratulations! All those years of working hard in your classes have paid off, you are finally strong enough, and you have become one of the “big girls” and you get to work en pointe!